The black ES-166UP-B 6-Digit Time Code Reader from ESE is designed to auto-detect, read, and display either SMPTE, EBU, ASCII, or ESE timecode. Time is displayed as hours, minutes, and seconds. In the event the reader receives an erroneous timecode, it continues to count. An error indicator (located to the right of the hours display) lights up when a bad code is detected. This feature can be turned OFF via an internal DIP switch (#3, bank 1). This reader is available with a LED display measuring 1" in height. The units receiving SMPTE (drop frame or non-drop frame) or EBU are also able to display date encoded user bits. An internal DIP switch (#1, bank 1) allows the unit to display this data (month-day-year format). The switch #2, bank 1 enables the day-of-year mode in which the date is displayed as day-of year (1-366). 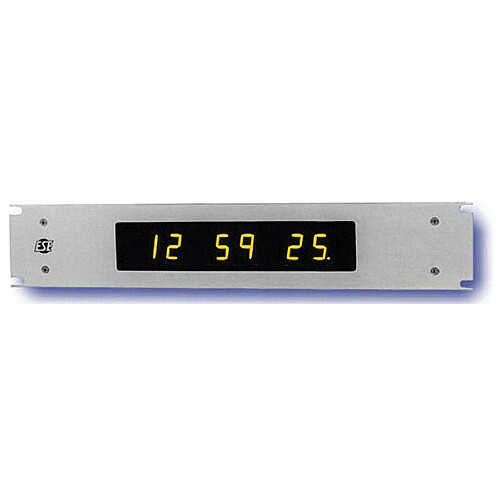 The 12HR DIP switch (#4, bank 1) allows the unit to display in 12-hour format. When in 12 hour mode, a PM indicator (located to the right of the seconds display) lights up during the PM hours. The units receiving ESE can accept ESE timecode (TC76, TC89, TC90) or ESE timecode. The units receiving ESE timecode display hours, minutes, and seconds. The units receiving ESE timercode display minutes and seconds and if the generator outputs tenths of second data and the reader has 6 digits, then the unit displays minutes, seconds, and tenths of seconds (99 : 59 . 9). The 12/24 DIP switch (#4, bank 1) allows the unit to display time in either 12 or 24 hour format. (If the unit is receiving TC76 in the 12-hour format, then only the 12 hour mode is available.) When in 12 hour mode, a PM indicator (located to the right of the seconds display) lights up during the PM hours. The date DIP switch (#1, bank 1) allows the unit to display date information, if receiving TC90 (month-day-year format for 6-digit units. The switch #2, bank 1 enables day-of-year mode in which the date is displayed as day-of-year (1-366). The units receiving ASCII display hours, minutes, and seconds unless format B is being received. These units accept RS-232C, RS-422A or RS-485 voltage levels at 9600 baud. Formats A, B, 0, or 1 can be decoded by the reader. The LX units use a male DB-9 connector for the ASCII interface, instead of a female DB-9 connector. The pin designations remain the same however. This should be considered while purchasing a cable for use with a LX unit. The data is output by the Generator Clock is in a 24-hour time format. The time may be offset to a local time by setting the time zone switches to the appropriate value. Box Dimensions (LxWxH) 24.75 x 14.75 x 6.0"